Actually, calling it an action figure does it a bit of a disservice. The term "action figure" conjures all sorts of images, mostly of very small men. 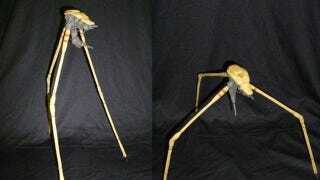 This custom Strider from the Half-Life universe is not very small at all. Not only does it look awesome, but its builder, nomadamusic, says it was almost entirely made from scratch, and even includes a few points of articulation. Who needs large toy companies when individual artists can make their own Striders? Not nomadamusic, that's for damn sure.